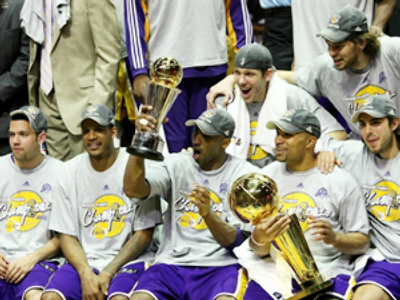 The Los Angeles Lakers have sealed their 15th title with a 4-1 series win over Orlando Magic. The Lakers won their latest encounter 99-86. The Lakers took control with a 16-0 run in the second quarter. Pau Gasol added 14 points and 15 rebounds for the Lakers. Rashard Lewis scored 18 points for the Magic, who were in the finals for only the second time. Kobe Bryant was once again the go-to man. His game-high 30 points was enough to earn him the richly-deserved MVP award. Kobe led the Lakers to their 15th overall title and their first since all-time centre Shaquille O'Neal left the team. Meanwhile, coach Phil Jackson now boast a stunning record of 10 NBA crowns under his belt. He has succeeded Boston's Red Auerbach for the most all-time wins.